This cooking ware is a must for most kitchens! 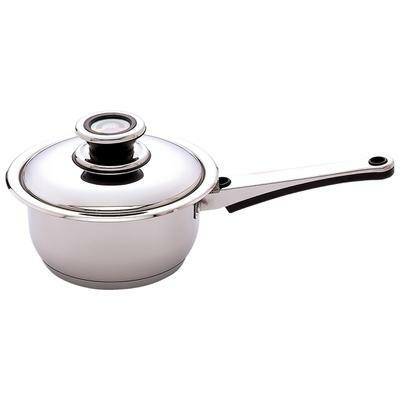 Look at this 1.5 Quart 12-Element Surgical Stainless Steel Saucepan that is the perfect size for preparing small quantity recipes. Choose this surgical steel cookware for its attractiveness and outstanding qualities. It will help you cook delicious soups, sauces, and vegetables for the family. Heavy gauge construction material Offers a durable and dependable cooking product. Riveted black handle Has a long reach and hang-up hole for pot racks or cupboard hooks. Large knob on lid Is easy to grip and cool to the touch. Flat bottom Will work on electric, gas, and glass top ranges.